Located in the Educational Complex, the McCoy Studio Theater is an intimate "black box" theater for small-scale performances, seminars, and meetings. 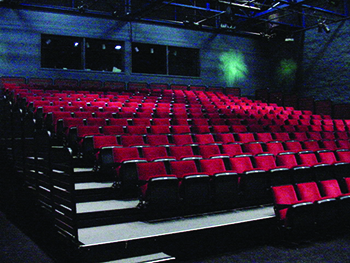 Seating is up to 250 forward-facing raked seats; may accommodate up to 50 additional seats on the floor facing side stage. This flexible space features an omni-directional lighting grid and movable stage and seating areas for conventional or cabaret performances. 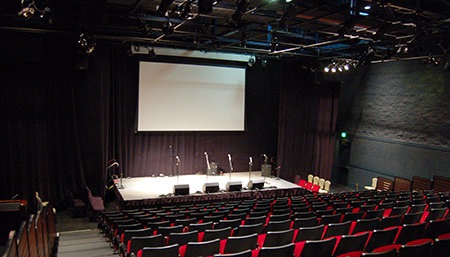 The McCoy is the perfect place for a theater play, an educational seminar, photo shoot, or to rent to meet your needs. The default stage is 12' deep x 24' wide x 32' high. The Center has a variety of decking that can be used to assist with a variety of configuration options as needed. Contact the technical director for availability & cost. There is one very large dressing room capable of handling large casts or groups. There is enough space for a wardrobe but there are no closets or hanging rods. At each end of the dressing room there is one bathroom and one separate shower room. The control booth is elevated for a clear view of the stage and has sliding windows into the house. The audio console is on one side and the lighting console is on the other. There’s a small amp room, breaker panels, and dimmer racks within the control booth. Clearcom headsets are available if needed.